The Garnet Crow cocktail is a very dark, nearly black red color. It’s dark and mysterious, in a Gothic sort of way, and it’s also very strong. This powerful concoction is oddly perfect for sipping along as you read Edgar Allen Poe. Or something about pirates. You might prefer to just watch TV. Or do anything that doesn’t involve operating mechanical equipment with any magnitude of danger, because with two ounces of vodka and two ounces of spiced rum in every glass, you’re not going to want to do anything strenuous or complicated. In fact, after one of these, you won’t be keeping up with the Poe anymore – you’ll have to switch to internet surfing instead. In any case, this drink blends pear, plum and peach juices with spiced rum, vodka and a hint of orange in the form of Blue Curacao. Needless to say, it’s delicious. Now, if four and a half ounces of alcohol is stronger than you’d like, you can dump the vodka and bring it down to two and a half ounces. That won’t change the flavor profile significantly. If you like this drink, check out the Spiced Watermelon Cooler, which also features Captain Morgan’s along with some fruit juices. Stir everything together in a glass without ice. Pour the mixture into a chilled cocktail glass. 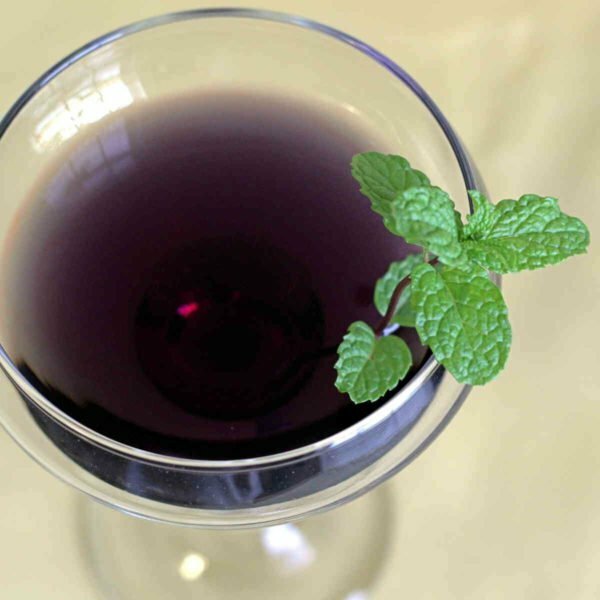 You can garnish with mint sprigs or fruit if you like. I kind of prefer this one dark and mysterious, with no garnish to warn you what’s coming.